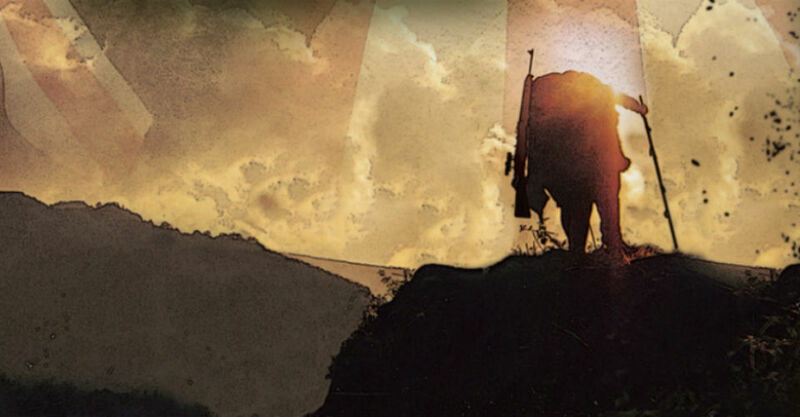 Star Theatre Two at Star Theatres, Fri 23 Feb.
Kokoda is a 70 minute monologue in which Todd Gray, as a young poorly-trained militiaman Private Morris Powell, re-tells his experience of the war in New Guinea in 1942. Gray’s comedic tendencies lay on the larrikinism a bit thickly to demonstrate the humble origins of the fighters in the 39th Battalion, but perhaps this only adds to the impact as Private Powell lives through the horrors of jungle warfare. These men were not the professional AIF. Many of them, derided as ‘chocolate soldiers’, had never seen a corpse before, let alone been asked to create one. 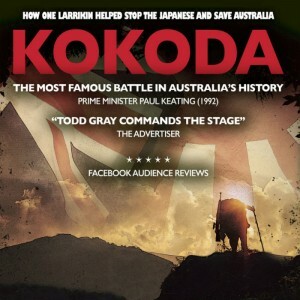 The action on stage is peppered by some actual Kokoda screen footage, including statistical information about Australian and Japanese participants, whenever Gray goes offstage briefly for costume adjustments. Maddern’s brilliant script manages to pack many of the key elements of the Kokoda campaign into a believable narrative. The heroism of Bruce Kingsbury and others, the strategic incompetence of General McArthur and General ‘Don’t Blame Me’ Blamey – including Blamey’s berating of war heroes for ‘running like rabbits’. There is even time to reflect on the way the (Keith) Murdoch press preferred to report trivial social engagements while sparing its readers any unsettling mention of events at Kokoda. If, as the author fears, the Kokoda campaign is barely understood or appreciated by the Australian public, then Peter Maddern’s Kokoda is a worthy start to redress the balance. The bloody gore associated with war is understated, leaving it to Todd Gray to convey the shocking truths verbally. It is therefore suitable for a general audience. This play deserves to be widely seen and appreciated. Kokoda continues at Star Theatre Two at Star Theatres, at various times, until Sun 4 Mar. A starkly dramatic re-telling of the Kokoda story.